The DIJ History and Humanities Study Group is a forum open to scholars working on Japan in any field of the humanities. It is organized by Torsten Weber and Ronald Saladin. November 8, 2017	/ 6:30 P.M. In the late Meiji era the system of hiring foreign contract workers (o-yatoi gaikokujin) to educate Japanese intellectuals came to an end. Instead of working at universities, foreign teachers were increasingly employed at university preparation schools (kōtō gakkō). In order to examine the German-Japanese transfer of knowledge in the late Meiji and the Taishō eras, this paper draws on an in-depth study of several German teachers living and working in Japan during this time. The research objective is to compare the situation of professors in Tokyo under the o-yatoi system to the situation of teachers at the new preparation schools. 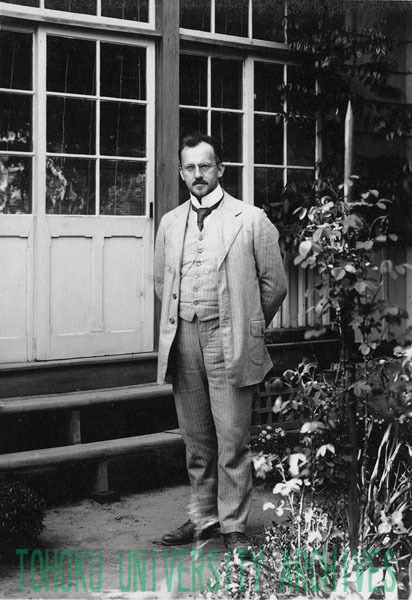 This talk will focus on the example of Georg Würfel who came to Tokyo in 1906 as a missionary and stayed as a teacher in Sendai, Miyagi, until his death in 1936. While he is rarely ever mentioned by his contemporary fellow Germans in Japan in their writings, Würfel influenced several thousand Japanese students and he was often also their first contact with a foreigner. In order to evaluate his impact, this research examines the writings and recollections of his Japanese students. The well-known scholar of German language and literature Kimura Kinji, for example, described Würfel’s influence as a teacher as one of the reasons he started studying German and later compiled his famous German-Japanese dictionary (Wadoku Daijiten, 1937). The poet Doi Bansui even dedicated a poem to Würfel and praised his importance for the understanding of foreigners in the Tohoku region. This talk will first introduce Würfel and then examine his activities in Japan. Why is he an interesting and important object of study in the research of the transfer of knowledge in that period? Furthermore it will analyse different types of knowledge transfer that can be observed during the 19th and early 20th centuries. It will argue that the German-Japanese case differs from the colonial transfer of knowledge as well as from the kind of knowledge transfer within European nations in the 19th century. Reik Jagno studied history and archaeology at Georg-August-University Göttingen where he is now working on his PhD thesis “Exploring knowledge transfer in the late Meiji time between Japan and Germany”. His publications include an article in Japanese on “The observation of the Eulenburg expedition in the German geographical magazines” and “Georg Würfel: A Zerbster in Japan”.